Energy is the key factor in economic development of country. Fossil fuels which are non renewable source of energy are harmful to environment. To replace fossil fuels, Energy Briquetting Machine is invented through we can produce biomass green energy with low cost. These machines have high production capacity and required less electric power to produce energetic bio fuel. 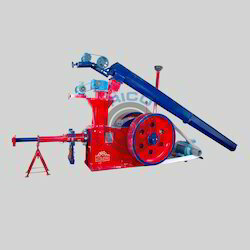 Energy Briquetting Press Machine is a way to generate renewable energy. Now a days climate change become big issue. Different industries release different kind of waste products which harmful to the environment that cause serious problem like pollution and global warming. Energy Briquetting Press Machine converts this waste product into renewable energy and protects the environment. Energy is the key factor in economic development of country. Fossil fuels which are non renewable source of energy are harmful to environment. To replace fossil fuels, energy briquetting plant machine is invented through we can produce biomass green energy with low cost. These machines have high production capacity and required less electric power to produce energetic bio fuel. This project converts low density biomass into high density biomass fuel that is called biomass briquettes or white coal. To provide pollution free energy in low cost is the main concept of energy briquetting plant project. Briquettes from divested material which can effectively used as best substitute of any fossil fuels and easily used in various kinds of thermal applications. Satisfying the demand of energy with non renewable sources which is limited and expensive is a big challenge. To solve this matter energy briquetting plant system is used to generate green energy with low cost. To convert waste into energy, many people are using energy briquetting plant system because it can produce bio fuel without polluting environment and at affordable rate.